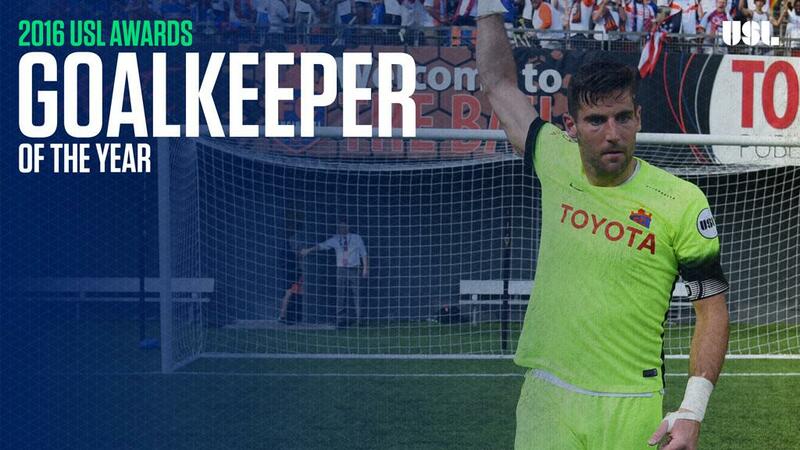 TAMPA, Fla. – The United Soccer League announced today FC Cincinnati goalkeeper Mitch Hildebrandt had been voted the 2016 USL Goalkeeper of the Year after leading the team to an outstanding inaugural season in the USL. The 2016 USL Awards were voted on by team management and a league-wide media panel that included representation from every USL market. Voting was conducted following the conclusion of the 2016 USL regular season. The USL All-League First Team selection, Hildebrandt was among the first signings unveiled by FC Cincinnati ahead of its inaugural season. A former member of Minnesota United FC, the 27-year-old quickly became a fan favorite in Cincinnati, and notched a number of highlight-reel saves throughout the season, including a double-save against Toronto FC II that earned him the No. 3 position on ESPN’s SportsCenter Top 10. Hildebrandt led all goalkeepers in minutes played in the regular season, and posted a goals-against average of 0.86 as Cincinnati finished tied for fourth-fewest goals conceded in the Eastern Conference. He also recorded nine clean sheets. Hildebrandt adds the 2016 USL Goalkeeper of the Year award to his 2011 PDL Goalkeeper of the Year award with the Michigan Bucks.